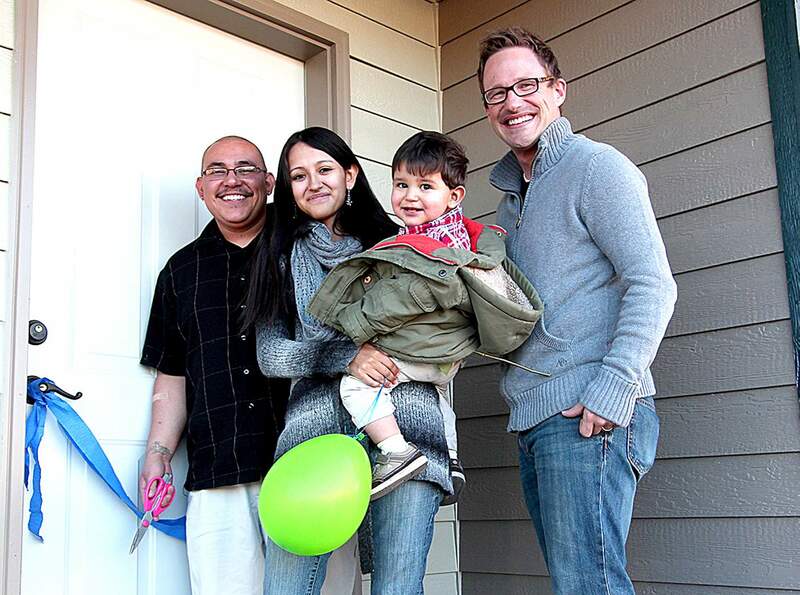 Excited to start moving into their Habitat for Humanity-built home are Stefanie and Steven Medina with their son, Estevan, pictured with the Rev. Mark Palmer from The River Church, who helped with the dedication, on Nov. 17 at Fox Farm Village in Bayfield. The Medinas put in 500 hours of sweat equity, including 200 hours on the build, to qualify for their new home. Anjoletta and Chris Krug with their son, Byron, and daughter, Brianna, are ready to cut the ribbon on their new Habitat for Humanity home on Nov. 17 at Fox Farm Village. The refrain of one of my favorite songs has a whole new meaning for two La Plata County families. Ill be home for Christmas, is what the Medina and Krug families will be singing as they decorate their trees and bake cookies in their new digs in Fox Farm Village in Bayfield, courtesy of their own sweat equity, the generosity of donors and volunteers and Habitat for Humanity of La Plata County. November was a busy month for Habitat as it kicked it off with its 14th annual Wine Tasting at the DoubleTree Hotel. The event would not happen without the generous support of Sherry Wertz, owner of Liquor World, who solicits donations from her distributors for the fruit of the vine, making this her signature event of the year. Or that of Peter Marshall, general manager of the DoubleTree, who provides the space free of charge. After almost a decade and a half, organizers have the details down to a science. An amazing 27 restaurants provided food, and the La Plata County Fair royalty drove all over the place collecting it. The Rotaract Club (Rotary for people ages 18 to 30), handled all the serving needs, as it has for many years. One thing Habitat really does well is spread the appetizers and desserts out among the amazing array of silent auction items, so partygoers are compelled to shop as they nosh. The buzz of the 330 or so attendees filled the room, and the Lisa Blue Trio added a great soundtrack to the evening. The Wine Tasting organizing committee included Chairman Jim Winzell, his wife, Judy Winzell, who also sits on the Habitat board as the fundraising chairwoman, Claudia Engle, Jeannie Bennett, Leslie Carlson, Annette Angst, Christine Myers, Brandi Fassett, Marci Baxter, Kaetti Wenger, Laurel Nye, Kayla Van Maanen, Jenny Hardy, Tierney Skahill, Charlene Sandoval, Virginia Wright, Velbeth Jones and Sandi Marlatt. All told, Habitat Development Manager Rachel Taylor said the event raised about $19,000 for the construction fund. 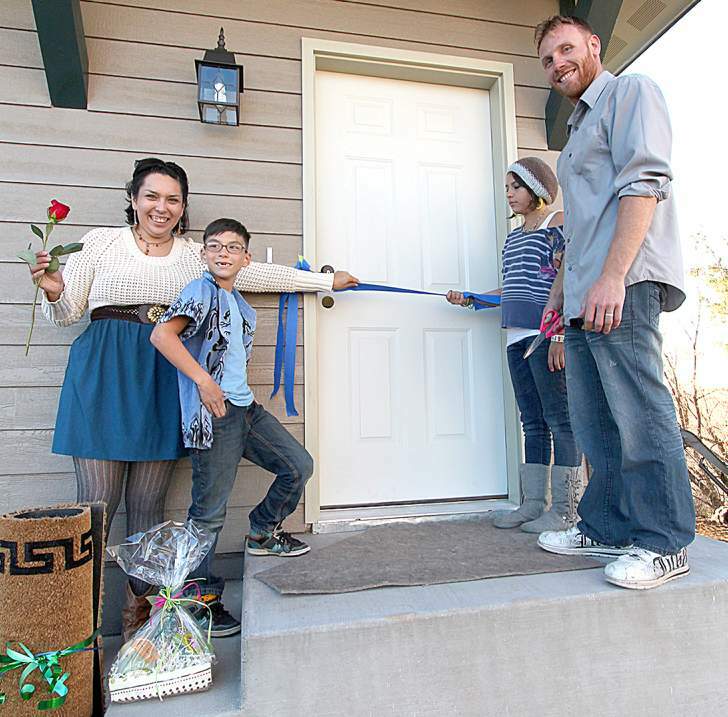 Which was good timing, because on Nov. 17, the Medinas and Krugs cut the ribbons on their new homes. But the impact of what Habitat does is far greater than the 38 families who are now in their own homes in our county. Most of the focus in the last couple of years on the affordable housing front has been growing the rental housing market, providing more and better rentals. Most have been one- and two-bedroom units, and the families who walk through Habitats doors cannot comfortably live in units designed for young professionals. Taylor said her research has shown that children who live in homes their families own tend to do better academically and get in less trouble. I imagine thats because of a stronger sense of roots and security. First-time homeowners tend to be more involved in their communities than renters, many of them voting for the first time and committing to homeowners associations and parent-teacher organizations. Those are all things to be encouraged and supported. But theres something else about a community where workers can afford to own their own homes. Businesses can attract the most qualified people to live and work there. Ive seen firsthand the Herald lose potential hires when they couldnt find a place they could afford to live. Taylor sat next to Daniel Snowberger, superintendent of Durango School District, at an affordable housing meeting, where he told her he had lost promising school principal candidates after they came and checked out the cost of living. If not just teachers, but principals, find our housing market that expensive, its a great illustration that we have a problem. Habitat is one of the few solutions that really seems to work. It rewards hard work  couples must put in 500 hours of sweat equity, which can include volunteering at fundraisers but must also include 200 hours on a build. Single parents must invest 250 hours, with 100 of those physically on a build. Each building season also pumps money into an average of 47 area businesses, so theres some economic stimulus involved as well. Taylor tells me 47 percent of La Plata County workers fall within Habitats eligibility for a home. Scary number, but that means many families would qualify if they applied. A Habitat home isnt a quick process. It includes orientations, counseling about finances and, of course, all those hours of effort. Habitat Family Services Manager Laurie Dickson said the time to get into the pipeline for homes in 2013, 2014 or beyond is now. Give her a call at 382-2215 to learn if youre eligible, and how to get started if you are. At least two of my colleagues at the Herald have earned their down payments through sweat equity at Habitat, and they, too, will be happy to be home for the holidays. To donate or learn more, visit www.habitatlaplata.org. Hoping their birthdays arent overlooked in the holiday rush are Patricia Mikelson, Melodie San Miguel, Beverly Schroeder, Arthur Kunkel, Antony Kuo, Emily Lavengood, John White, Larry Hock, Danny Pierce, Bev Dittmer, Curtis Swanson, Carol Thurman, Dell Manners, Kyle Branson, Eve Gilmore, Norman Broad, Rita Lee, Richard Gallavan, Tonya Wales, Paul Duggan, Genna Kidd, Patrice Lindeman, Larry Gaugh, Meredith Mapel, Claudia Root, Logan Stetler, Isabelle Bussian, Kathy Longwell, Oliver Morris, Susie Ragsdale, Doug Brouner, Cindy Burnett, Chessa Gill, Ann Karnes, Angelina Kondrat, Sandy Zink and Derek Lancaster. Celebrating their anniversaries with holly and ivy are Wilbur and Bonnie Rossmiller and Charles and Laura Thames. I am happy to consider photos for Neighbors, but they must be high-quality, high-resolution photos (at least 1 MB of memory) and include no more than three to five people. I need to know whos who, left to right, and who to credit with the photo. Candid photos are better than posed, and photos should be submitted as .jpg or .tif attachments.